SUVs can either be great to look or end up looking like an elevated hatchback. I've never been a fan of such crossovers (if I may call it), but then the world seems to be interested in anything that stands out, literally. It's a mixed world out there, be it food or music; fusion is taking over. 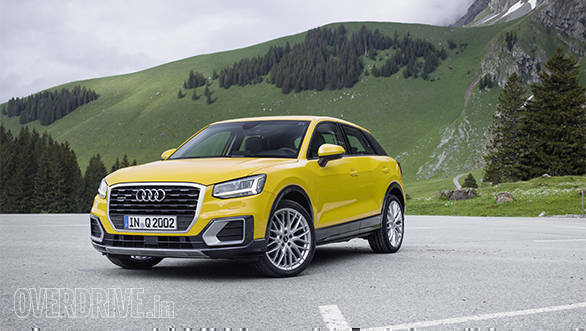 The car you see here is the Audi Q2, a compact SUV that's based on the A3. However, in this case, I actually like the way it looks. It's a good mix between a premium hatchback and sporty SUV. The design language of this vehicle is very different and a departure from traditional Audi styling. In fact, it's just won various awards in many categories in the Automotive Brand Contest even before its launch. 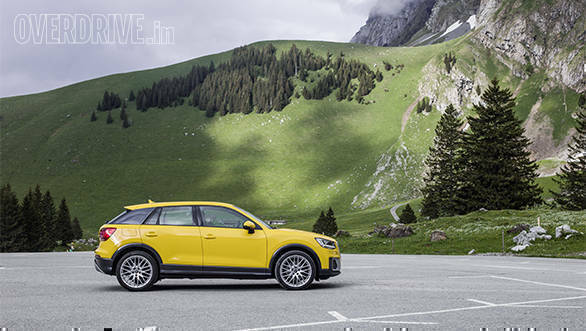 It's also the smallest vehicle in the Audi Q portfolio, and when it comes to India (yes it is! ), the Q2 will be the most compact offering. 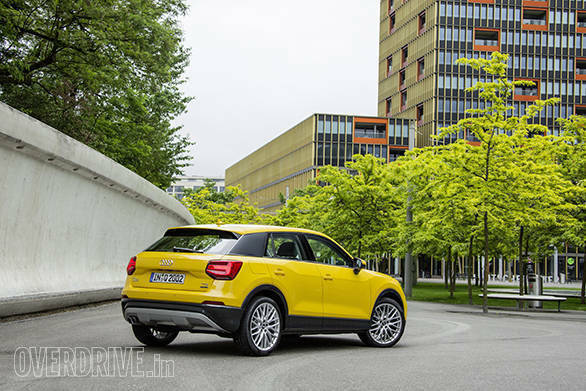 We tested the Q2 around Zurich to get to know the SUV better and also to find out if it is as much fun to drive as it looks. Look at any Audi today and you know it's from the same family. It's attractive but then the design is simplistic. The Q range of vehicles? Well, they are even more serious. Come to think of it -- the Q2 is the least conservative among all Audis. It's the first car that's been developed under design director Marc Lichte. 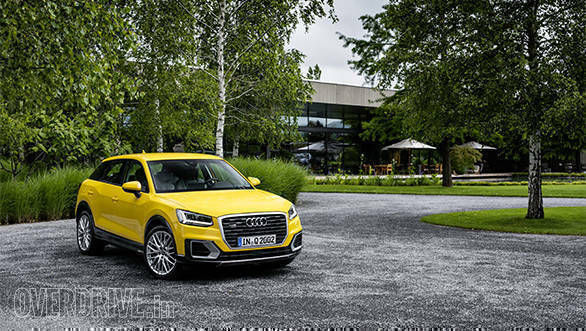 The Q2 has been designed to appeal the younger audience and it definitely does. There's an edgy design all around the car. In fact, Audi has used a polygonal design theme that is specific to the Q2. I lost count while trying to look for various polygon shapes. The face is striking, thanks to a new octagonal grille design that features a thick border. This grille along with the overall width, which is on the higher side, adds to its presence. This newer design could also preview the theme for upcoming SUVs like the all-new Q5 from Audi. The headlamps are also very different; they are edgy and feature the newer style, arrow-shaped DRLs. Then there's the chunky and large air dam with contrasting silver highlights adding to the sporty look. The sides are fresh and look like no other Audi. The silhouette is very hatchback like, and it's the height that gives the Q2 SUV character and presence. While the Q2 looked more hatchback to me when I first saw it in pictures, in the flesh it's a different story. The wheel arches are wide and accommodate the large 18-inch wheels well seen in the S line trim. The lower variants get standard 16- or optional 17-inch rims. One of the standout side features is the hexagonal and concave highlights on the front fender and door going with the design theme. It's quite unique and adds a lot to the attractive styling. There's also the large C-Pillar that Audi calls 'floating blade'. It took me some time getting used to seeing a large flat piece. It's offered in different shades in the base trims and is finished in silver in the S line variant. It can be further customised to go with the roof colour or finished in carbon fibre. As a result, it becomes a floating roof. It's not just a design feature, but the floating blade also improves the car's aerodynamics. The rear window, however, looks smaller as a result. The rear is again very new and looks more like a VW hatchback than Audi SUV when it comes to design. It still is a good looker, and the lamps get LED lighting that look great even during day. The boot opening is wide, thanks to the design of the lamps which is more squarish than the other Q siblings. Overall, the Q2 features an all-new design language that's very different from the rest of the Q vehicles but still comes across as an Audi. Step inside and you'll notice that the interior is very similar to the A3, the car it's based upon. The dash layout is almost the same so you get a simple yet luxurious interior. There are very few switches giving it an uncluttered look. Quality of materials used is top-notch and finished well too. It's definitely feels like a proper luxury car and never gives the impression if being an entry-level Q vehicle. The Q3, in fact, is beginning to look dated in comparison. Even the steering is from the sportier S3. Unlike the A3, the Q2 even gets Audi's brilliant virtual cockpit. So the instrument console is basically a huge screen that displays all data, including speed, infotainment and navigation. This allows the driver to focus a lot more on driving the car with all the info being displayed close to sight. We've seen this feature in the TT, Q7 and R8, but it's nice to see this cool tech feature in a vehicle like the Q2. It is an optional feature in international models, so we will have to wait and see if the India-spec Q2 gets it. Since it's targeted at a younger audience, the Q2 also gets optional interior inserts matching with the body colour. Ambient lighting can be customised too. The yellow Q2 we drove featured matching lighting on the dashboard and centre console, something we've never seen before in an Audi. The SUV is definitely the most customisable vehicle from Audi in terms of styling. The Q2 is about 4.2 meters long, so it's slightly shorter than the Creta and about 200mm short of the Q3. Cabin space, however, is still impressive. The front seats offer a lot of space and good support. With the seat set to my position (I'm 5ft 9inch), I could sit comfortably at the back without my knees touching the seat ahead. In fact, the cabin can easily accommodate four large adults. The middle row isn't as comfortable, and since it splits 40/20/40, the centre part is quite hard too. A sloping roofline may seem to rob away vital rear headroom but this isn't the case. There are quite a few storage points too, while the doors can accommodate large bottles as well. What about boot space? 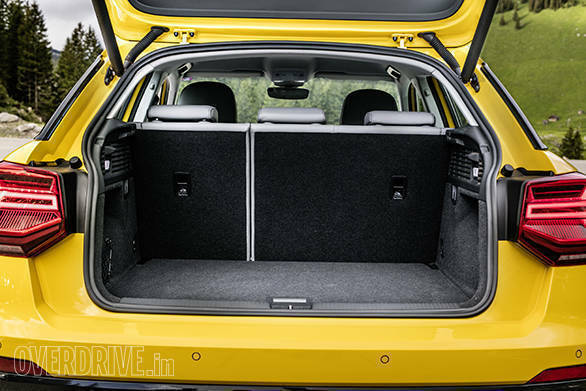 Interestingly, there's 405 litres on offer, that's more space than the average premium hatchback and only 15 litres less space than the larger Q3! 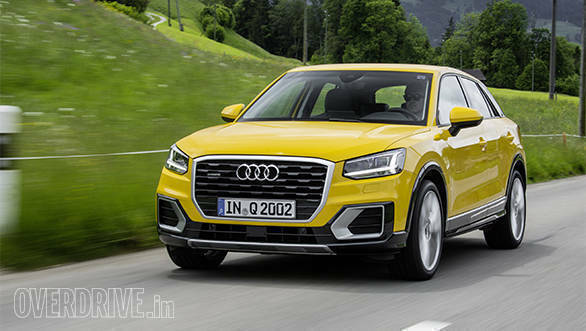 The Audi Q2 will be offered with four different engine options in various states of tune. There are two petrol units ranging from the 1.0-litre 3-cylinder TFSI putting out 116PS to a 1.4 TFSI 150PS motor. A larger 2.0-litre 190PS version is expected to roll out later. Expect India to get the 1.4 petrol as it's already available in a few Volkswagen cars in India. The diesel options include a new 1.6-litre TDI that produces 116PS as well and the larger 2.0 TDI that we are used to seeing in various Audis and VW group cars in India. This engine in the Q2 produces 150PS just like the 1.4 TFSI. This is the diesel that's expected to roll out in India. There's also a more powerful 190PS version and that's the Q2 we drove around Zürich. This and the other power versions are the only variants to get the Quattro all-wheel drive system as standard from the time of launch. This engine in the higher state of tune is very refined and offers more than sufficient power. Power delivery is linear and speeds climb up pretty quickly. The engine feels eager and goes well with the Q2's sporty character. The engine is mated to an S Tronic dual-clutch transmission that makes full use of the power on offer. The transmission is quick and offers smooth shifts too. Downshifts could have been as quick though. The Audi drive select system even tweaks the transmission based on the selected mode. However, despite offering 190PS, it didn't feel as powerful on the road. There's 400Nm on tap too but never felt like it. However, we will leave our final comments when we drive the car more comprehensively in the future. Audi says the Q2 feels like a go-kart, something Mini has been saying since quite some time now with the Countryman and Cooper. On the road, the Q2 is quite capable though not as involving as a Mini. However, despite the short length and added height, the Q2 handles quite well, especially around fast corners and in town. This is possible because of the wider track. Ride quality is impressive too. While our driving route only involved smooth roads, we cannot comment on the ride over broken roads and potholes. The various driving modes make a difference. The steering, for instance, gets additional weight while speeds increase and can get more direct and heavier based on the drive select mode chosen. Even in comfort mode, the steering weight though light is better set than the A3 (good news). The Q2 gets a long list of standard safety features as well as optional extras. In European models, the SUV gets standard pre-sense safety feature. This feature includes emergency braking and pedestrian detection. There's also adaptive cruise control, lane monitoring and traffic sign recognition. We aren't sure if India-spec Q2s will get this feature; besides it's mostly radar-based technology. However, what the Q2 will get are standard airbags that also includes curtain airbags apart from driver, and knee and passenger protection. Traction control system and stability controls are also on offer. The Q2 is a very appealing vehicle and should be a hit amongst younger buyers. In Europe, the Q2 will start from 23,000 and will go on sale by autumn. This price makes it more affordable than the A3 and Q3. It's positioned below the latter and will be the same when it makes it to India sometime in 2017. However, expect the Q2 to start at Rs 25 lakh when it arrives in India. This means the car will be slightly more affordable than the A3. This will give the customer an option to either choose an Audi SUV or sedan for almost the same price. 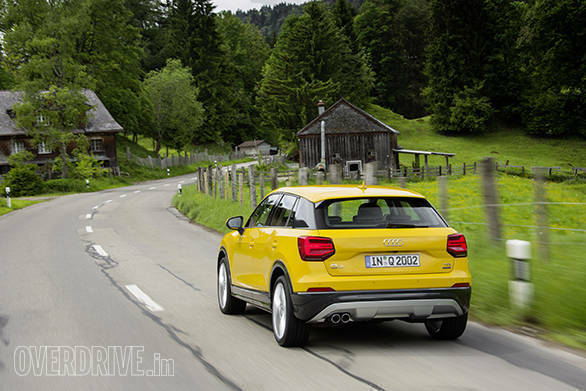 If Audi can price the Q2 as mentioned above, the SUV has the potential to do really well in India, a market that loves SUVs. It looks cool, is sized perfectly for India, drives well and is powerful too.